The Innu First Nation on Quebec's North Shore is working with Boralex to create the Apuiat wind farm in Port-Cartier, Quebec. A wind farm project planned for the North Shore of Quebec is putting the provincial government at odds with Hydro Quebec. The Innu first nation that lives in the region between Baie Comeau and Sept Iles has been promoting the Apuiat wind turbine project for several years. 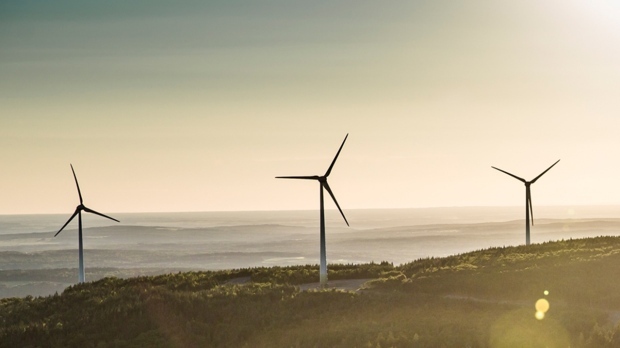 The $600 million, 200 MW wind farm was first proposed three years ago as part of Hydro Quebec's 2006-2015 plan to increase renewable energy capacity by 4,000 MW. Its supporters say the Apuiat project would create 400 construction jobs. However Hydro Quebec President and CEO Eric Martel recently said the wind farm was unnecessary, and wrote a letter dated August 6 saying that Hydro Quebec has an energy surplus for years to come. He estimated that paying for the electricity created by the 57 turbines that would make up the Apuiat wind farm would cost the Crown corporation $1.5 to $2 billion over 25 years. The leaders of the Innu nations that support the project were upset by Martel's letter, and wrote back that they could not make sense of the estimates used by Martel. Meanwhile Coalition Avenir Quebec leader Francois Legault said he did not think the project was viable, and said that if he became premier on Oct. 1 he would cancel the project. Premier Philippe Couillard said Monday that the wind farm project should be built, while Natural Resources Minister Pierre Moreau that despite Martel's assertion, the wind farm project would not increase the electricity rates paid by Quebecers. Negotiations between the Innu community and Hydro Quebec concerning the wind farm resumed this week. Martel said Monday that the meetings will aim to identify solutions for the project. Hydro Quebec's board of directors also met Monday to analyze the dispute, and board chair Michael Penner then issued a statement that Hydro Quebec supports pursuing an open and constructive discussion with the Innu Nation.